Trump signed an executive order on Wednesday to end family separations at the US border. But thousands of children had already been taken from their parents by then under Trump's "zero-tolerance" policy. Trump scored a political reprieve with the order, but no there's no evidence that any families have yet been reunited. It also isn't clear how well-equipped the Trump administration is to manage such a process. There is no evidence so far that children and parents separated at the US border have been reunited, or even to indicate the Trump administration has any plans to do so. Before Donald Trump signed an executive order on Wednesday to end the separation of families at the US-Mexico border, children were being taken from their parents as a matter of course. 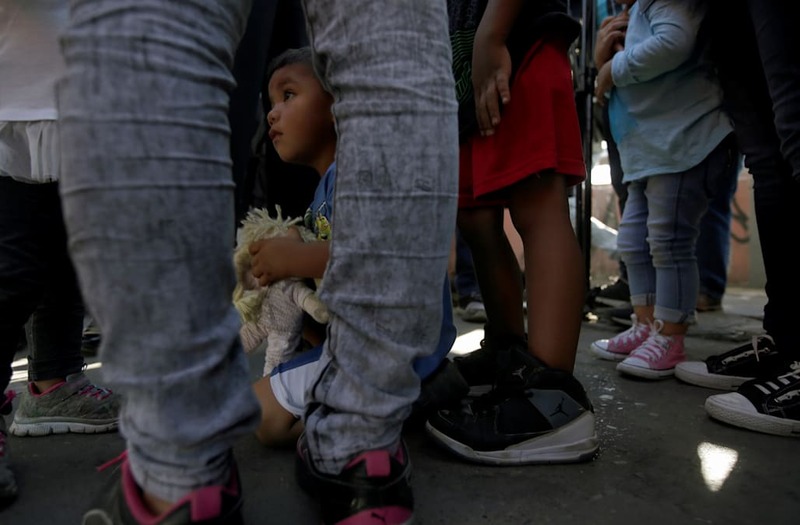 Under Trump's zero-tolerance policy, adults were detained and referred to criminal prosecution under the Justice Department, while children were transferred to shelters under the care of the Health and Human Services Department (HHS). Trump's order ended the separation policy, but did not address the families who have already been separated. Government departments have made vague gestures towards planning a solution, but have not yet made any concrete, verifiable steps. The Justice and HHS departments operate separately and are not geared up to communicate with one another, which is "causing the very difficult process of reuniting these families," said Efrén Olivares, a director at the legal advocacy nonprofit Texas Civil Rights Project. The Department of Homeland Security (DHS) says it detains people for no more than 20 days, but makes no mention of whether it would reunite parents with their children after separation. At least 2,000 children were forcibly removed from their parents between April 19 through May 31 alone. The government has not yet said how many were separated from June 1 to June 20. "This is an administration that did not think through reunification at all"
Trump's Wednesday executive order, which effectively ends family separations at the US border prior to detention, has made no mention of reuniting the families who have already been separated. "This is the tragedy upon tragedy upon tragedy at this stage. ... The executive order does not address it [reunification] and in the hours since the executive order, it is absolutely clear that the Trump administration made no plans for reunification: When this all started, information was not in the database, fingerprints weren’t taken — all the stuff that you would do if if you were worried about reunification. "It's not even clear if it's a priority for the administration at this stage. There's a lot of statements in the last couple hours here in the United States, [and] it's not even clear who's in charge of reunification. This is an administration that did not think through reunification at all." The inside of a dormitory at the Tornillo facility, a shelter for children of detained migrants, is seen in this photo provided by the U.S. Department of Health and Human Services, in Tornillo, Texas, U.S., June 14, 2018. ACF/HHS/Handout via REUTERS Picture taken June 14, 2018. ATTENTION EDITORS - THIS IMAGE WAS PROVIDED BY A THIRD PARTY. The Tornillo facility, a shelter for children of detained migrants, is seen in this photo provided by the U.S. Department of Health and Human Services, in Tornillo, Texas, U.S., June 14, 2018. ACF/HHS/Handout via REUTERS Picture taken June 14, 2018. ATTENTION EDITORS - THIS IMAGE WAS PROVIDED BY A THIRD PARTY. Brian Marriott, the HHS's senior director for communications, said on Wednesday that "reunification is always the goal," and that the agency "is working toward that" for the families separated under Trump's zero-tolerance policy, The New York Times reported. However, Marriott's statement, the Times noted, left open the possibility that children could be connected with other family members or "appropriate sponsors" in the US, rather than the parents they were taken from. According to the US Customs and Border Protection website, the HHS and Immigration and Customs Enforcement (ICE) "is dedicating a facility as its primary family reunification and removal center" and "will work with detained parents to provide regular communication with their children through video teleconferencing, phone, and tablets." The statements avoid saying whether these plans are in place yet. Blanca Orantes-Lopez, a woman from El Salvador, was separated from her eight-year-old son at the border and is now detained at a federal center in Washington state while her son is 2,200 miles away at a children's shelter in upstate New York. Orantes has had no opportunity to contact her son and her sister, who lives in Maryland, has been denied permission to take care of the child. "What every administration, Republican or Democrat, has done in the past is prioritise the prosecutions. You want to keep bad people out, [so] the people who deserve legal protection, like asylum seekers, actually have a path forward. It's not perfect but it's certainly better than this alternative." The Trump administration is now seeking to amend an existing decree known as the Flores settlement in an effort to allow families to be detained together indefinitely. Currently, children cannot be detained for longer than 20 days. Business Insider has contacted the Departments of Homeland Security, Justice, and Health and Human Services, and the Immigration and Customs Enforcement, to seek more information but has yet to receive responses.